The pour over method has established itself as the most popular coffee brewing style among the world’s top baristas. But the regular coffee drinker should also try this style at home. 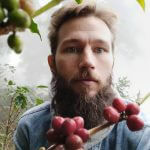 In just a few years pour over coffee has gone from being a bit of an obscure hipster phenomenon to the favorite brewing method for specialty coffee lovers everywhere. Around 2011 when hand drip started to really gain traction, the selection was quite limited. Everybody was more or less using the Hario V60, except Blue Bottle Coffee who insisted that the old school Bonmac dripper was the essential model. Today you have a lot more options when you’re looking for a manual drip coffee maker. In this article, I’ll take a closer look at the differences between all these models, and help you find the right one for your needs. 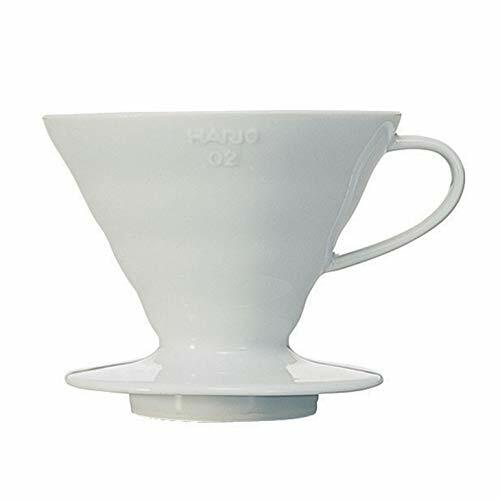 My choice for the best coffee dripper is the Hario V60 Ceramic Coffee Dripper. It’s a modern coffee classic and a favorite among baristas all over the world. With this coffee dripper, you’ll have full control over how your coffee turns out. You can make a strong, full-bodied cup of coffee or a more acidic one, depending on your brewing style and recipe. Investing in your first pour over brewer is a relatively simple task. Compared to something like an espresso machine, it’s a tiny post on the budget and it should also be less confusing since the technology isn’t that complicated. Pouring water on ground coffee and letting gravity do the work is called ‘infusion’. This is one of the oldest coffee brewing techniques along with ‘immersion’, which is what the French press relies on. With infusion, the shape and type of the filter will affect the flavor of the final cup. However, it’s definitely possible to overthink these things. Most of the models out there (except the Clever Coffee Dripper) have so much in common. Even though certain drippers may have ‘signature’ flavors it’s definitely possible to steer whatever brewing contraption in a direction you like by using certain techniques and recipes. For instance: The Clever Coffee Dripper is known for producing less acidic cups compared to the V60 but a different recipe could make up for that. Pro-tip: Remember that you need a gooseneck kettle to get the best results with a coffee dripper. Check out my background article that covers everything regarding kettles for coffee. If you ask me, your primary concern should be the paper filters. With something like the Hario V60, Kalita Wave or Chemex, you’ll end up using proprietary filters. These can be slightly expensive and difficult to find in your local supermarket. Are you ready for this kind of task or not? Other models, such as the Clever Dripper, work perfectly fine with a standard coffee filter (‘Melitta’ style). No matter which model you go for, however, make sure that you get some proper oxygen bleached filters. No, white filters aren’t unhealthy or bad for the environment. Just make sure that they are oxygen and not chlorine bleached. All brown filters give off a bit of cardboard flavor to the coffee, so getting a quality filter is essential! 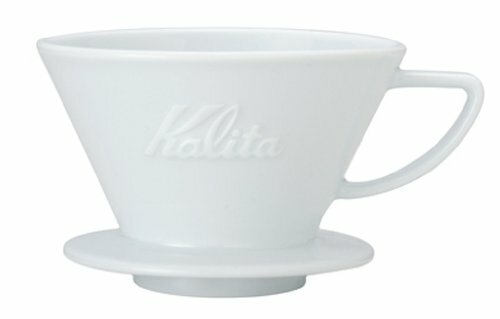 The Kalita Wave was the first model to challenge the dominance of the Hario V60. The Wave is named after the special shape of the filter. 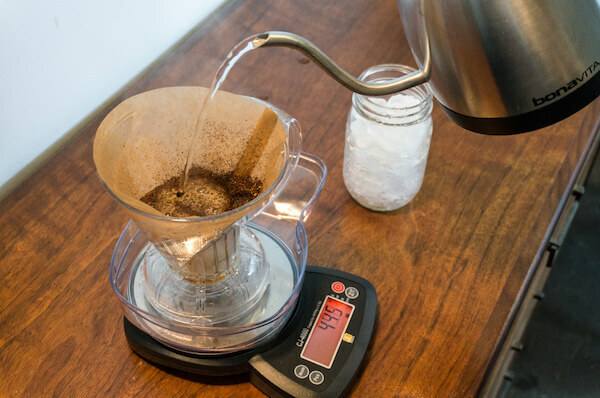 The idea is that the filter shelters the brew bed from the cone, and thus creates a more stable brew temperature as well as an evenly extracted brew bed. Cleanup with the Wave is a breeze as well as you simply remove the filter and rinse the dripper with running water. Compared to its rival, the Wave is known for being more newbie friendly. The three small holes in the bottom make it more forgiving when it comes to technique – or at least that’s the idea. The stainless steel version is the most common one, but I don’t recommend it since the filter has a tendency to get clogged and therefore slowing down the drip rate. Read more about that issue here. Especially, the bigger steel version named ‘185’ suffers from this issue. Instead, I’d opt for the ceramic version which has a much more consistent flow rate. The glass model brews great coffee but it’s very fragile. If you’re just a little bit clumsy – like most of us are in a caffeine-deprived early morning state – then go for the ceramic one. 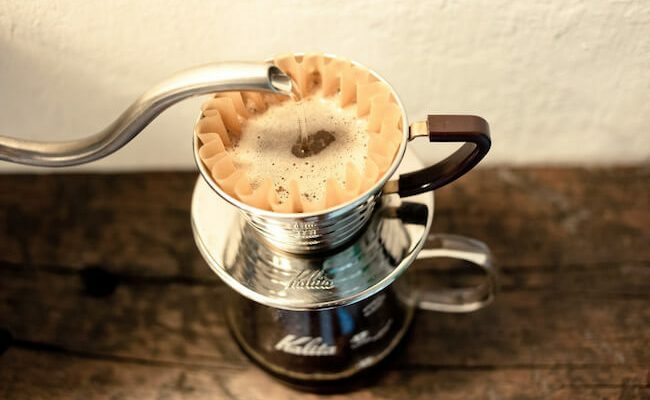 The Kalita Wave is a great hand coffee dripper – just avoid the big stainless steel version. It’s a bit easier to use than the Hario V60, but it tends to produce a cup with less acidity and more rounded sweetness. Also, it can be a bit more difficult to find the special wave-shaped filters for the Kalita. That being said, it’s still a great dripper that I often use myself. I adore this dripper by the Japanese brand Munieq. It’s created specifically for the travelling or outdoorsy coffee lover. When you disassemble the three parts, it takes up almost no space and the weight is around the same as a regular toothbrush. 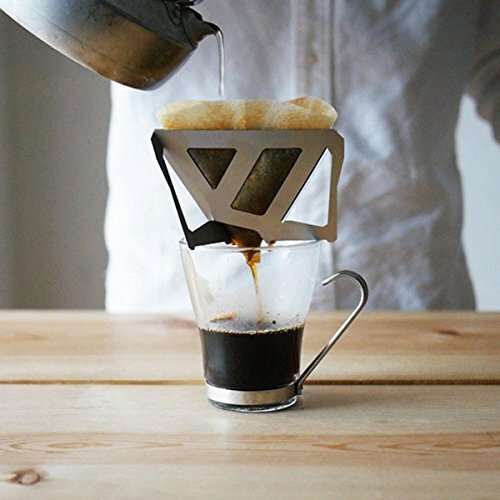 Even though this pour over cone is meant for travel it still produces an excellent cup. It extracts more flavor than the Hario V60 so the flavor profile tends to be full-bodied yet fruity. It uses the cone shaped filters like the Hario V60, so the two models do have a bit in common flavor wise. The Tetra Drip is also available in a cheaper and even lighter plastic version. If you travel a lot and want to have great coffee on the road, get this dripper. If you solely want something for home use I’d probably go with one of the more traditional models. 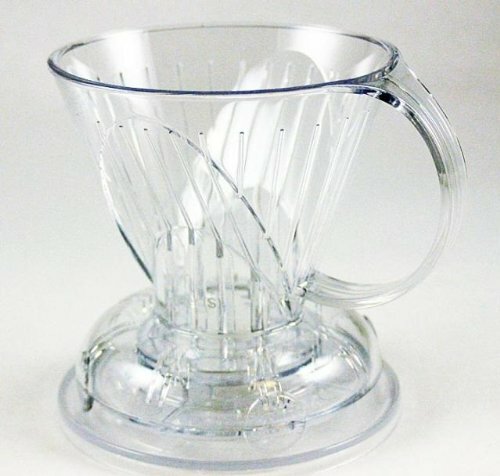 The Hario coffee dripper is the undisputed king of manual drip coffee. And for a good reason. The flavor is rich and nuanced at the same time with just the right amount of acidity. It works by sitting it on top of your mug or carafe while brewing. It gives you full control over how your coffee ends up including the time, water flow, and the water temperature. This control means you can end up with the perfect cup of coffee. You can purchase this coffee dripper in ceramic, glass, metal, or plastic, and it comes in several different colors. Essentially, the material doesn’t really matter and many elite baristas prefer the plastic model. However, if you like something more premium then consider the copper version. This model has a sleek design that is convenient, and it is easy to store. Additionally, it comes in three different sizes – most people prefer the medium sized one, intuitively named number ’02’. Often you can find it in a bundle deal – a so-called coffee pour over kit or set at a good price. It has a ridged vortex shape that is designed to stop the paper filter from sticking to the side of the cone while you’re brewing. This feature ensures that the grounds get extracted the right way every time. Because of the shape, it is sometimes called a pour over coffee cone. If you want to brew world-class filter coffee you have to consider the Hario V60. This pour over coffee dripper has been favored by a majority of the recent world champions (Aka Brewers Cup winners) for a good reason. The Clever Coffee Dripper technically isn’t a pour over coffee maker. Instead, it’s a mix of immersion brewing and filter coffee. However, for all intents and purposes it is the same, so that’s why we have included it on the list. Plus, it’s a pretty great device. The dripper is made of safe BPA-free plastic, and it comes in a large and small size. The way it works is that you pour all the water in at once. There is an easy shut off valve that holds your coffee until the brewing process is finished. Once you place the dripper on top of your range server, the valve releases the beverage. This model seamlessly pairs the functionality of a French Press with the convenience that comes with a coffee dripper for a full-bodied, smooth taste. This coffee dripper can appeal to all levels of coffee drinkers. It has a sophisticated look, and it is easy to operate and use again and again. This smaller coffee dripper might be an excellent choice for someone who only drinks one or two cups of coffee at a time. Read the full review here. 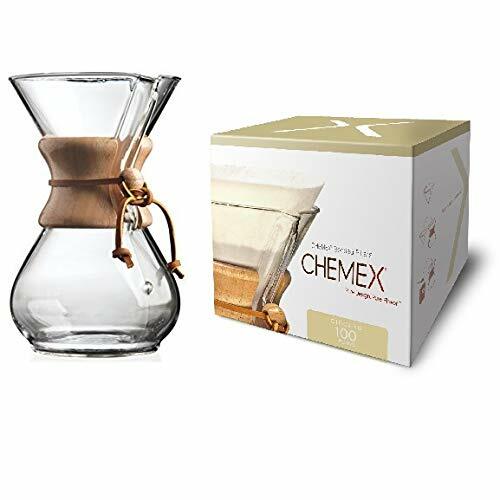 The Chemex coffeemaker comes with two different style options and it can brew up to 10 cups at a time. This hourglass-shaped coffeemaker is made entirely out of glass, and this makes it chemically inert. It won’t pick up any chemicals or odors from previous brews. The wooden collar acts as a heat blocker, and it can prevent you from getting burned when you handle it. It attaches to your Chemex brewer with a durable leather cord that makes it easy to take off and put on for cleaning purposes. You can also opt to get the Chemex classic with a handle instead of a collar, but honestly, I much prefer the unique look of wood and glass. It is relatively easy to clean and use. You insert the filter into the Chemex, boil your water and pour it over your coffee grounds in the filter and watch it brew. For cleanup, simply remove the filter and throw it away and rinse your Chemex out. Tastewise it’s close to the Hario V60, but a bit more on the thin side. The proprietary Chemex filters are a bit thicker, and therefore take out more of the coffee oils. If you like this or not is up to personal preference, however, I like V60’s flavor a bit more. The Chemex Coffeemaker is a great choice if you want to brew larger batches of delicious pour over coffee and have a penchant for stunning design. Bodum is famed for their siphons and French presses, but recently entered the pour over scene. This coffee maker features a sleek and slim glass design that may appeal to a lot of people. It is a manual drip brewer that comes in three different sizes and a variety of silicon collar colors. The silicone collar works to give you a water-resistant, comfortable, temperature-resistant grip. The filter on this coffee dripper is mesh and made out of stainless steel. It sits in a BPA-free plastic cage, and this helps to ensure that you don’t lose any of the full flavors of your coffee during the brewing process. This machine is also relatively easy to use. You just add your coffee and pour a little water over your coffee grounds, ensuring they get thoroughly wet, and add the rest of your water. Set it and let it brew. This coffee maker comes at a good price. It makes eight 4 ounce cups of coffee at once. 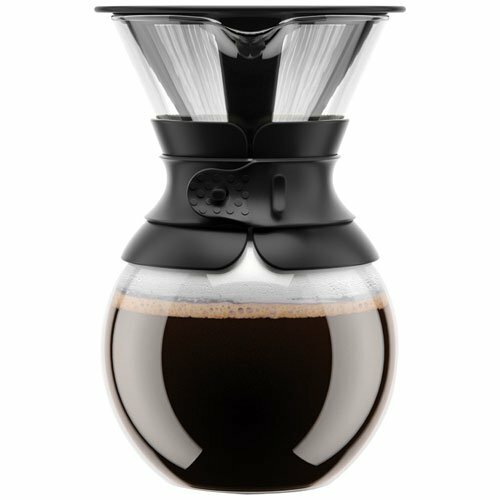 The Bodum Coffee Dripper is stylish and elegant. It’s also capable of brewing a large batch. Just be aware that this brewer uses a mesh style filter. Some models have a permanent mesh type filter. These manual drip coffee makers aren’t the best if you ask me, because they allow a lot of coffee oils to enter the cup. They tend to produce coffee with less acidity and clarity – two of the most distinguishing trades of a good cup of pour over. Pour over coffee makers are typically made out of the following four materials. They all have their pros and cons, so you should also keep that in your mind before making any decisions. Glass is another popular pour over coffee maker material. It is also chemically inert, and it won’t add any unwanted flavor. For best results glass should be preheated to keep your blooming coffee grounds at the optimal temperature. Glass usually looks great, but it’s not for the clumsy home barista! Metal, especially copper, is a good option if you’re looking for a durable and lightweight coffee dripper. However, metal like stainless steel doesn’t hold heat well. As it doesn’t insulate well, it can affect how well your extraction goes because your coffee grounds can lose their temperature quickly. Plastic can be a great alternative to ceramic coffee funnels as it weighs less and is very durable. If you plan on bringing your pour over coffee maker on the road, plastic should be on your radar. Plastic used to be seen as inferior compared to some of the more premium materials, but in recent years more well-known coffee experts such as Scott Rao has started to recommend plastic drippers because they don’t steal any heat from the brew bed.